The Democratic Blue Dog Coalition released this photo with their latest inductees on November 27, 2018. If I hear the word “moderate” used one more time to describe Blue Dog House Democrats who keep voting with Republicans, or any other non-Republican who actively supports today’s Republican Party, it is entirely possible I will eat my teeth. The term “Blue Dog” is a metaphor for a dog straining so hard on its leash that it has turned blue from lack of oxygen; the dog is a right-leaning Democrat, and the leash represents its tenuous party affiliation. These people are conservatives — period, end of file — who hide behind the “moderate” label even as they undermine policies Democrats have hewed to for half a century. Their fallback tactic is ease: Inaccurate labeling stands in substitution for analysis because it is easier, tropes outmatch facts because they are easier, and lies from “important people” are not simply allowed to stand, but to flourish. Why? Because it is easier. “House Democrats exploded in recriminations Thursday over moderates bucking the party, with liberal Rep. Alexandria Ocasio-Cortez threatening to put those voting with Republicans ‘on a list’ for a primary challenge,” reads the opening line of last week’s febrific Washington Post article on the Democrats’ meeting, only the most recent example of the practice. There are 137 words in the first four paragraphs of that thoroughly frantic report, a bunch of which clearly strive to become lit sticks of dynamite in the next life. Exploded! Moderates bucking the party! Threatening! On a list! Primary challenge! Frustrated! Lashed out! Pressured! Unquestioned media superstar! Upped the ante! Admonishing! Liberal activists! Unseat! On a list, again! Would that I had pearls to clutch. “Unquestioned media superstar” takes the biscuit in paragraph three, however. 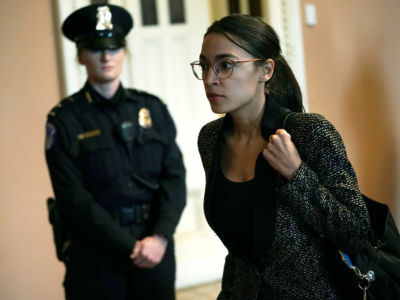 The term refers to Rep. Alexandria Ocasio-Cortez while simultaneously dismissing her intelligence, skills, passion, wit, will and political savvy by turning her into another bit of TV fluff that will only be popular until the next big hot-minute celebrity comes along. She is bigger than that by many long miles, and those who can’t or won’t acknowledge that are setting themselves up for one hell of a surprise. What was this House Democrats’ meeting about, anyway? Why were Democrats “exploding” over “moderates’” behavior? The meeting centered around the use and misuse of a legislative maneuver called a “motion to recommit.” It allows the minority party to add amendments to a bill just before it is brought to a vote. The rule exists to keep the majority party from wielding unlimited legislative power, and is something each party protects for the day when they find themselves in the minority. Ever since the Democrats took control of the House, Republicans have been using the rule to stick abrasive nonsense amendments to important bills. While it is gratifying that enough conservative Democrats won in 2018 to alter the balance of power in the House, that altered balance is utterly meaningless if the Republicans are still allowed to call the shots. House Republicans wanted to jam the words “illegal immigrants” into a Democratic gun bill as a means of putting a tack on Speaker Pelosi’s chair, and the Blue Dogs were their willing dupes. The background checks legislation passed by the House last week was the most important bill on the gun violence crisis passed by that chamber in decades. There has already been a vote on the Green New Deal, and there will be more to come on equally important Democratic priorities. These Blue Dogs need to wise up on a tactical level, or they are going to find out what life is like on the back bench with no committee assignments and a primary opponent who has Ocasio-Cortez on speed dial. In the meantime, can we please dispense with the notion that these Blue Dog types are “moderates”? If they vote with conservatives, they are conservatives. Politicians like Alexandria Ocasio-Cortez are not part of some far-out faction to be marginalized by the puddle-minded media; they are the moderate Democrats. The clear-sighted policies they espouse — addressing the immediate threats of climate change, gun violence and wildly expensive health care to name but a few — are deeply pragmatic necessities. Furthermore, these policies are all wildly popular with voters on both sides of the ideological spectrum, and can be paid for with an adjustment of our national priorities. The F-35 Lightning II fighter aircraft is expected to cost at least $1.5 trillion before all is said and done. I can think of a few coastal cities which could use that money to stave off the ocean, which is coming, whether we like it or not. It’s either that, or the “conservatives” can try to bail the onrushing tides out of the boulevards with the alms bowls they usually fill with oil and coal dollars. The choice has become that stark. It is time for the Blue Dogs and their media pals to get with the program and stop hiding behind meaningless labels and discredited tropes. The avalanche has begun, and the pebbles are taking the ride whether they like it or not. If they want to be on the right, they can try being on the right side of history, if there is anyone left to write it.